Pet Peavy: Having to study during the World Series. via Full Count » Red Sox starter Jake Peavy says he’s ready for biggest game of his life against team that almost traded for him. Nice Job by Alex Speier. As I eluded to in my previous post. This World Series could hinge on the perfomance of Jake Peavy tonight as well as the possibility of him starting a game 7 (hopefully ala Derek Lowe results). I trust him, but then again my memories of him are mostly when he was a Padre.. with a 98mph heater. Now, I definitely have more faith in him than Dempster, Doubront and Workman.. and quite frankly.. that’s why we traded for him. This is why he is here. Much better then sending unproven Allen Webster against Joe Kelly, not that that was an option, but that’s how money ball could have played out if our organization was a bit more frugal. I also love the idea that we get Peavy for another year, and I’ll be hopefully even more sweet as a defending champ. Because otherwise, I’d see it as a logjam in the rotation of which we need to start throwing our minor leaguers into the fire and testing them at the game’s highest level. Anywho.. lets not get ahead of ourselves. I am nervous about tonight, but that’ll be over in about 5 hours one way or another. Interesting to see what will unfold with the bottom of our lineup. Will Steven Drew break out of his epic slump? Will we replace him with Xander at short and see the return of Middlebrooks to 3rd in game 4? Will Nave be effective given the little amount of playing time he’s received? Will Dustin’s thumb hold up? Can Ellsbury steal a base? Can Ortiz handle first base? Their answer was Gomes, because Napoli will likely be used a defensive replacement for Ortiz at 1st. And he’s a prone to strike outs. Ellsbury, Nava, Ortiz, Pedroia, Xander, Salty, Drew, Peavy and Victorino. I like peavy batting 8th, because even with the possibility of a quick inning.. I like having Victorino and Ellsbury connected, and pinch hitting for the #8 hitter would not interrupt our speed on the base path. All of this is outside of my control. Just gonna keep my finger’s crossed. “I’m Not Superstitious, but I am a Little Stitious” : The Birds and the Beards. Do I, as a fan, honestly believe that what I do has any impact on a baseball game being played hours away by grown men who will never know my name? I don’t. But has that stopped me from developing a variety of quirks, habits, and superstitions over the years? It hasn’t. via “I’m Not Superstitious, but I am a Little Stitious” | Fire Brand of the American LeagueFire Brand of the American League. A Great Article By Jack Keller. I grew up taking the train from our home in Connecticut with my mom, to NYC, and during those 45 minutes before iPhones and even cd players… we had a thing called the newspaper.. and there were basically only two sections that I would read. 1) The funnies (http://garfieldminusgarfield.net) and 2) the sports section. I grew up with my mom pointing out what an RBI meant, Hits, Homers, Batting Average. And I would check it DAILY… see who was close to batting .300 and who were below the Mendoza line. I was born in 1989, which means that I had the (un)lucky childhood of seeing the Yankees win perennially, but boy oh boy was rooting for the underdog so much more fun, and stressful. I’m surprised there were not any balding, diehard, 8-year-olds. We had Nomar and his 3 minute bat and glove routine between pitches, Pedro buzzing people by the ear, Jose Offerman, Brian Daubach and a whole other bunch of forgetful names and woeful september collapses. We all knew if we could score a run, pedro would win… but the guys the only pitcher to throw a no-hitter through 9 and still lose the game in extras. Any who.. point being.. over the years I grew my own superstitions, nothing specific, but I’d get this uncanny feeling that my daily karma would affect their win loss record. Like.. If I were to accidently litter, I would start walking away and then think to myself, “If I don’t go pick that up, the sox will lose” Seriously, baseball made me a better person, if not a weirder person.So I picked up those bottle caps and would hold on to them for hours until I could find a receptacle. I mean I’d be willing to risk having a chewing gum glued pocket than to piss off the baseball gods. This ties in to the superstition of not saying the word ‘no hitter; during a no-hitter. So many times, like clockwork, do I see an announcer, or a friend, look at the score, say.. “oh! he’s throwing a no-no..” and the VERY NEXT PITCH.. base hit.. up the middle… or a bloop.. or w/e. I know, i know.. there is no way my actions could affect their play. And i know that thousands of baseball… even sports fans get overly attached to something bigger than themselves. But its fascinating.. isnt it? Like.. the sox were down by like 5 runs one day.. and I was pissed and grumpy.. and i started kicking off my shoes and I took off my right sock and then all of a sudden.. base hit.. sooo.. I sat there motionless.. for like 2 minutes until… another base hit.. followed by another.. and a few runs and half an hour later.. I’m still frozen on the couch with a sock in my hand afraid to move.. did it work? kinda.. but we still lost the game, maybe I twitched or something. Or someone else near Fenway missed the garbage can and ruined it for the rest of us. Ha. So I’m in Law School now, just my luck, the year I leave Boston after 7 years of being there, they make it to the World Series. So I’m flooded with reading, and there is another sox fan at this small NC school (Elon) and it was Game 6 of the ALCS, the sox were down in the middle innings. So we both decided to leave the library to catch dinner separately and come back to the library and finish studying for our Property midterm the next morning. Oy was I stressing out, I would not have been in a good mood had they forced a game 7, and to study with that nervousness would be.. really tough. So, I try to do anything i could to get the sox bats hot. I did push ups, showered, threw my sox T on, lucky underwear (superman boxers), favorite hat, and went back to the library. As I walk in, I kid you not, that same friend, Chris, had changed his clothes also.. Authentic Sox Jersey, both sporting our beards and we just laughed at each other that we kinda.. just had to do this. My only remaining question is.. If the sox win the World Series… Do I get to shave? or Do i have to keep it for another full season… heck.. If it meant we’d get a handful of rings in a row… is it worth it? The job interviews. The lack of girlfriends.. I might have to stay in the south and apply to Duck Dynasty to maintain the Red Sox Dynasty. Quick World Series Predictions: The Birds and the Beards. I can not wait to fix this house of cards. Can you guess who is the real Joker ? Finally a W for the Red Sox to even the series 1-1. Great feeling. Also, FYI, before this game.. 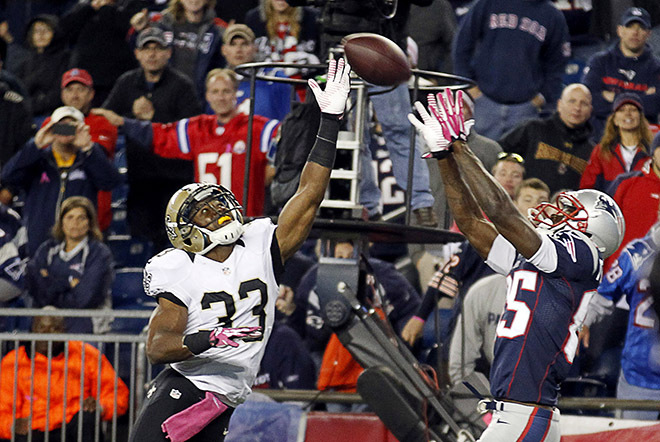 The Patriots had won in the Last 10 seconds of the game with a Brady touchdown pass to Kenbrell Thompkins. I was feeling pretty lousy also before the comeback, and earlier in the 4th Quarter I got a text asking if I wanted to go for a run. And I was like.. Nah I got a lot of property reading to do, go ahead, I will see you later…. then the magic happened.. then i texted them back saying: Have you guys left yet, I feel rejuvenated. During the run, I told them that this was a good luck run for the Red Sox. So ,in about an hour from now I will go on another good luck run to help us gain a 2-1 series lead. 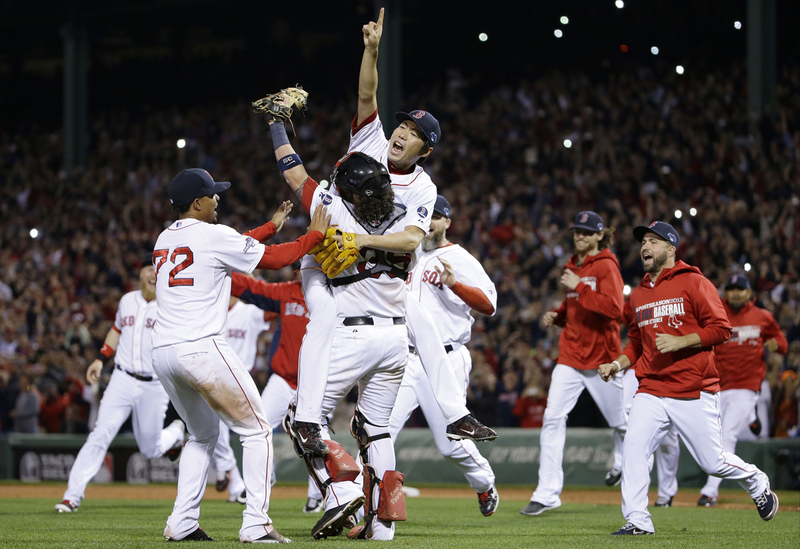 Forever Remember: 10/13/13- 2 Amazing Boston Wins. I have never screamed louder for a measly base hit than I did in last night’s loss to the Tigers. Gotta hand it to them, this is not a blame game with umpire, but 17 strikeouts, and 13 men left on base with only 1 hit in the ninth inning… they deserve all the credit. How do you get 6 walks and go 0-6 with runners in scoring position, and not get a base hit. We pushed their pitcher to 120 pitches in 6 innings, but could not break through. 2 games in the ALCS.. both 1-0 scores, against the ACE of their respective teams. Sanchez is their #3 starters, so now we have this uphill battle against the 2 best pitchers in the AL. Lets home Clay and Lackey have a few gems in their pocket, or the bats to wake up, because otherwise, 2 games from now, would could be looking down a big 3 hole, and these handy beard trimmers are starting to look pretty good. 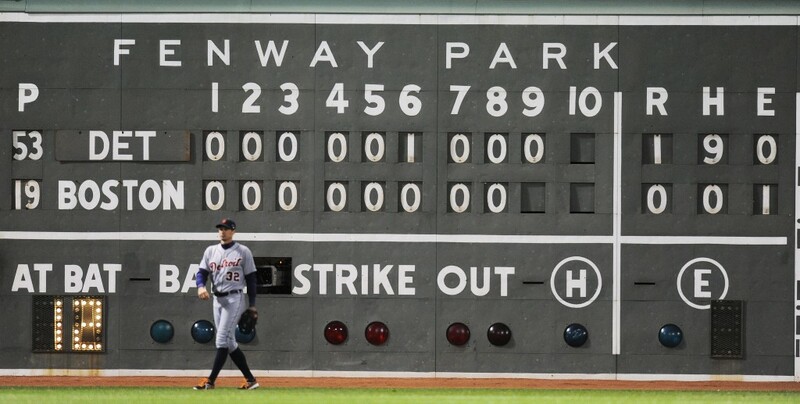 So thank you Nava for preventing an embarrassing combined no-hitter in the first game of the ALCS. I was really happy to see Xander pinch hit, but not with 2 outs in the 9th. I was drinking Boston Lager, hoping for an X-men walk-off win. A few interesting points from last night. 1) why did Ross start the game, only to be pinch hit for later by Salty? Are his numbers that much better against a pitcher we haven’t faced? 2) Why didn’t Berry steal 2nd, a batter earlier. Then Drew’s sac-fly could have gotten him to 3rd base with 2 out. We all know a wild-pitch there could tie the game and shift momentum. 3) I was talking to by buddy Caolan at the Red Sox bar Stumble Stilskins in Greensboro, NC during the game. And it was the 5th inning, 2 on, 2 out for Peralta. AND I SAID: Walk him, load the bases, he’s the guy that hit a double in his last at bat, I’d rather go after Infante. He said: No, there are 2 out, best go after him. Few seconds later.. the decisive bloop single that scored the winning run. Easy to look in hind sight of what we ought to do. Whenever I get in a one-run deficit.. I tell myself.. HEY we had to at least score a run to win the game, so that AINT THAT BAD. UNLESS.. you end up praying.. we have to get a hit to avoid embarrassment.. This series really hinges on what Middlebrooks, Drew and/or Xander can do. Because if you can effectively silence Ellsbury and Victorino.. our spark plugs.. and with Napoli fresh off a Belhorn besting record. There are just a lot of uncertainties… and we need a few clutch hits from everybody. A loss is a loss. Time to turn the page.. do some law school reading and watch tonights game with a lucky playoff beer-d. This has nothing to do with Law School, but I want… nay.. I NEED this video on my blog. For easy access. For those tired days in the library, for the sunrises that I’ll witness in my apartment doing homework and for the emotional uplift.